In this edition we’ll be covering a long overdue victory, our robust budget campaigns (including big budget wins for homeowners and immigrant New Yorkers), plus some local and federal advocacy around disability, civil rights, and consumer issues. We secured one of our most important victories early in the legislative session, with the passage of the Gender Expression Nondiscrimination Act (GENDA), which was finally passed and signed into law in January, after sixteen years of advocacy from transgender community members and allies. We will shortly begin working on updating our landmark Know Your Rights Guide, which describes what unlawful discrimination based on gender identity or expression looks like and explains what you can do if it happens to you. Empire Justice was one of the leaders of Communities First, a statewide budget campaign that succeeded in securing $20 million to continue efforts to stabilize communities through foreclosure prevention. Senior Attorney Kirsten Keefe appeared on the Capitol Pressroom with Susan Arbetter, following a rowdy press conference on February 5th to inform the public of the campaign; VP for Policy & Government Relations Kristin Brown was interviewed several weeks later. Though the critical funding was missing from the initial budget proposals, this effective advocacy campaign secured the funding at the 11th hour. In another big victory, this time for immigrant New Yorkers, Empire Justice helped secure $10 million for the Liberty Defense Project. 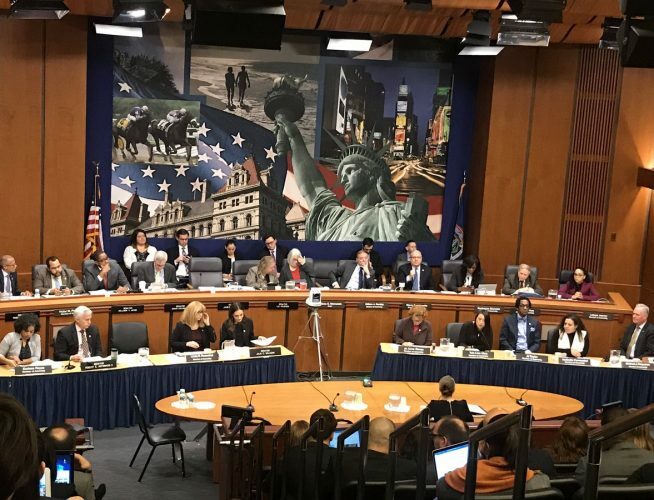 Empire Justice is among the legal services providers assisting immigrant New Yorkers facing deportation, seeking asylum, or in need of other basic legal assistance through this important program – which was also not included in initial budget proposals- you can read more in our Human Services Testimony. We worked with allied advocates to secure continued, stable funding for other important programs in this year’s budget, such as Community Health Advocates (CHA), the Disability Advocacy Program (DAP), as well as the Managed Care Consumer Assistance Program. We also successfully advocated for new student loan servicing requirements, and the permanent extension of the post-financial crisis law requiring notices including available services and mandatory settlement conferences to homeowners who are struggling with mortgage payments. Human Services – Testimony Relating to Child Care, Civil Legal Services, Access to Health Care, Homelessness, Disability, and Immigrant Rights. Consumer Protection – Testimony Supporting Protections for Student Loan Borrowers. Housing – Testimony Supporting for Communities First and Foreclosure Prevention. Education – Testimony Supporting the Restoration of Protections for Public School Students Under the Human Rights Law. Home Stability Support – provides rent and heating supplements to enable low-income New Yorkers to remain in their homes. Essential Plan Expansion – expands eligibility for the Essential Plan health benefits to individuals who are not currently eligible due to their immigration status. Child Care Cost Estimation Study – implements a study to gather information to establish the actual cost of providing high quality child care to NY’s low income children. For-Profit College Accountability Act – protects college students by setting forth five critical standards for proprietary higher education institutions. Permit Low Income People to Retain Drivers’ Licenses When Owing Unpaid Tax Debt – helps low income people to keep working when they are unable to pay their taxes. Our CEO and President, Anne Erickson, was interviewed by Alan Chartock on WAMC’s In Conversation. Anne (also the Vice Chair of WAMC’s Board of Directors), talks to Alan about the importance of access to critical, sometimes life-saving, civil legal services, the changes that Democratic control of the State Senate are bringing to NYS politics, and her upcoming retirement. Happy Birthday 35th Birthday to the Disability Advocacy Program (DAP)! We celebrated the success of this program with other members of the DAPWorks Coalition, supporters, and the founder of the program, Assemblymember Richard Gottfried along with Assembly Task Force on People With Disabilities Chair, Phil Steck. Here’s to another 35 years of helping disabled New Yorkers and their communities! We didn’t let budget madness get in the way of advocacy in a number of other areas either! We submitted these comments on small dollar lending, prepared by Research/Policy Analyst Barb van Kerkhove, to the Federal Deposit Insurance Corporation (FDIC), making the case that small dollar loans are a benefit to both consumers and financial institutions. Senior Paralegal Cheryl Keshner spoke at a NYS Division of Human Rights event about challenges faced by immigrants in Suffolk County, NY. Our Benefits team released a new chart illustrating child care copayment disparities by county, which contains county by county information on the copayment multipliers for all social services districts and the annual and weekly fees assessed against a family of three at 200% of poverty in each county. We submitted comments, prepared by our DAP Coordinators Catherine Callery and Louise Tarantino, opposing the Social Security Administration’s proposal to eliminate the education category, “Inability to Communicate in English”, which, if adopted, would severely impact the ability of disabled people who do not speak English well or at all to receive disabilities benefits for which they otherwise qualify. The New York Bar Foundation awarded us a grant to convert our Foreclosure Pro Se Guide to a video in both English and Spanish! If you’d like to learn more about what we’re working on this legislative session, check out our 2019 State Legislative Agenda.